Norwich Cathedral was founded in 1096 by Bishop Herbert de Losinga and built using Normandy stone shipped over from Caen. By 1145 the building had been completed, under the direction of Bishop Herbert's successor, Eborard de Montgomery. The Cathedral was established as a Benedictine monastery with its 'rule' based on worship, hospitality and learning, three principles which continue to underpin the work of the Cathedral today. An excerpt from the Rule of St. Benedict is read at Evensong each day and the Cathedral has three Residentiary Canons, one taking responsibility for each of the three principles. In 1272 serious riots and fighting erupted, resulting in almost all the Norman monastic buildings, including the Cloister walkways, being destroyed by fire. In 1362 the timber spire fell in a hurricane and in 1463 it perished after a disastrous lightning strike. It was Bishop James Goldwell who commissioned the rebuilding of the spire, using brick encased in stone and raising it higher than any of its predecessors. This is essentially the same spire which dominates the city today. Today the footprint of the original monastery has been recreated with the addition of the Refectory Restaurant and the Hostry Visitor & Education Centre, opened by HM Queen Elizabeth II in May 2010. The Cathedral itself is one of the finest complete Romanesque buildings in Europe, and boasts the highest Norman tower and largest monastic Cloister in England. It houses more than a thousand beautiful medieval roof boss sculptures. Norwich Cathedral has survived riot, war, plague and fire to fulfil its mission. 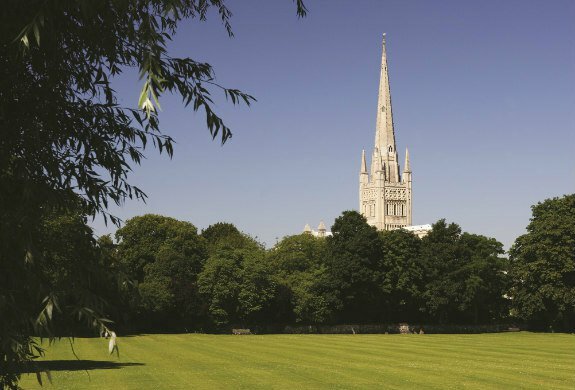 For over 900 years it has dominated the Norwich skyline bearing witness to the glory of God. It has always been greatly loved by the people of Norfolk and was voted the county's favourite building. Norwich Cathedral's Hostry Visitor & Education Centre was opened by HM Queen Elizabeth II in May 2010. It is the main entrance to the Cathedral for visitors and houses the Song School, The Weston Room conference facilities, the Bowerbank education room and an exhibition space. The Cathedral and Hostry host a wide variety of orchestral concerts, choral recitals, fayres, plays, exhibitions and lectures throughout the year. Norwich Cathedral boasts the largest monastic Cloister in England. It is two stories high and was designed to house a community of approximately 100 monks. Today you are able to access the Refectory and Hostry, as well as the Library, from the Cloister. The Cathedral Labyrinth was laid in the Cloister Garth to commemorate the celebration in 2002 of the Golden Jubilee of HM Queen Elizabeth II. Norwich Cathedral Close is the second largest in England (44 acres / 17.8 ha) with several fine and ancient gateways. This oasis of tranquillity nestles as a village in the heart of the city. Here can be found a rich mix of domestic buildings ranging from Norman to Dutch gables, flinted frame cottages and Georgian terracing. The Close is often used as a location for period drama. Our award-winning Refectory offers a welcoming place to meet up and enjoy newspapers and a range of refreshments. All our food is freshly prepared by our talented team of chefs and we are particularly well-known for our scrumptious soups and tasty home-made cakes and scones. Our daily menu includes hot lunches as well as salads and a choice of sandwiches. Find out more. Visit our Shop in the Nave for a wide range of locally-produced items including jewellery, music CDs and children's toys. Exciting themed discovery trails for children are available for purchase. The shop is also our box office for Cathedral events. The Cathedral is open daily from 7.30am - 6.00pm. Please note that entrance to the Cathedral is through the Hostry Visitor & Education Centre during Hostry opening hours - see below. Group guided tours run all year between 10am and 4pm and last approximately one hour. Tours cost £4 per adult and £2 per child/student. Please contact the Cathedral Reception on 01603 218300 at least one month in advance so that we can make the necessary arrangements. For more information see the tours page on our website. The Schools & Family Learning Department offers a range of themed, guided, school visit programmes for all key stages. Themes cover Local Agreed Syllabus concepts for R.E., National Curriculum History and many more cross curricular subjects. All are adaptable for SEN, EAL, parishes and community groups. We also offer various activity days and events for families, community groups and parishes throughout the year. We seek to bring alive the wonderful history of the cathedral and the Christian story for all. Wheelchair access and wheelchairs to borrow. The Refectory Restaurant and Coffee Shop is open daily. Group bookings welcome. Tel: 01603 218321. Email: refectory@cathedral.org.uk. Find the perfect gift from our selection of specially sourced products. We love to celebrate our beautiful Cathedral and its many stories, so expect to find gifts exploring the themes of Julian of Norwich, Edith Cavell and The Green Man, as well as lovely items produced by the fine people of Norfolk. Norwich Cathedral Library incorporates the Lincoln Theological Institute Library. For more information please contact the librarian on 01603 218327 or email library@cathedral.org.uk.